Let’s dig deep in the beloved Akvavit or Aquavit as you might see it spelled. This loved spirit can be found all over Scandinavia and is consumed year round. Luckily it’s not that hard to make your own, let’s find out all you need to know and I’ll throw in a recipe for a good one to try out as well. Akvavit is one of the most important things being served at Christmas in Scandinavia. Not only for Christmas but for almost all major holidays in Scandinavia (and whenever there is a good reason for) someone will bring out a bottle of Akvavit and glasses will be filled and then emptied. Sometimes there is singing before each shot but that is not necessary, as Scandinavians like to focus on what’s important so if the singing interrupts the drinking then leave it out. First, let’s start with what Akvavit is. Akvavit is a spirit that is flavored with herbs and or spices. It is served like a shot, usually called “snaps”. Besides being flavored with herbs and spices it could also be matured in oak or sherry casks to give it additional flavors and color. A regular unflavored vodka can also be served the same way as an Akvavit, even though it is not technically akvavit but simply a “snaps” or shot of vodka. The Akvavit is often served with beer, but if you are a purist you do not help to wash down the booze with the beer, you don’t want to ruin the flavor or the snaps. There is also a debate on whether to serve it chilled or not, and the same goes here. Purists want to serve and drink the Akvavit at room temperature to taste all the flavors. Modern weak people like it ice cold and sometimes keep their Akvavit in the freezer. Not ok people, not ok. By serving it too cold you will not get any of the flavors and could even be hurting yourself by drinking it super cold. The middle way and what I recommend is to serve it slightly chilled, but not ice cold. That is both accepted and the best way, just don’t tell the purists. Akvavit is also big business for all producers on the Scandinavian market and there are new releases every year, you can buy collections of mini bottles with lots of different flavors, you can see a few examples of the varieties on the Swedish government controlled Systembolaget here. But even though people like to stick with their favorites, the top three of sold Akvavits have been more or less the same for ages. Since the tradition of akvavit dates back far in history the packaging is often very traditional. But there are new varieties coming all the time, see a list of some great looking akvavit packaging designs here. Akvavit as a name is protected by the European Union. The standard is that to be called Akvavit it has to be flavored with dill or cumin and have an alcohol level of 37.5%/75 proof, additional flavors are legal. This is one of the reasons why you see at a lot of Akvavit being sold with the spelling Aquavit or Aqvavit. From a consumer standpoint, this is completely irrelevant, just as long as we get our hands on our beloved Akvavit were fine. No matter how it is spelled. The oldest brand in Sweden is OP Andersson, released in 1891 (and one of my favorites). Norwegian Linie Akvavit is stored on boats that go across the equator and back to give the full flavor. Use the link to read the full story on Linie Akvavit. The first mentioning of the name Akvavit was found in a Danish letter in 1531. 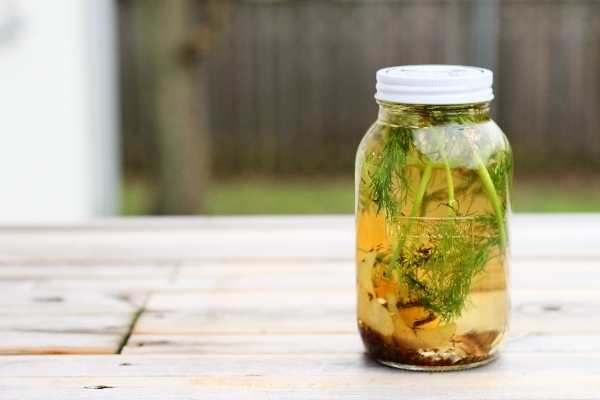 But what about making your own Akvavit? No problem, this is something a lot of people are doing, myself included. It is very simple and can easily be done at home in a few days time. 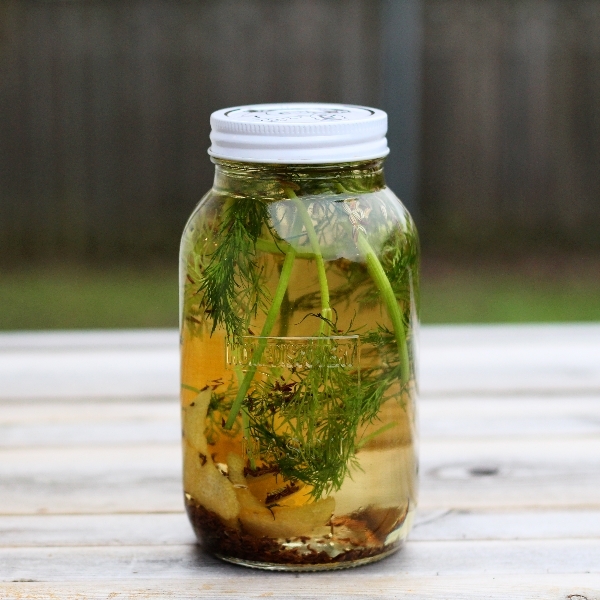 What you do is simply to put any herbs and spices you like in vodka and let it sit for a few days or up to a few months and let it flavor your vodka. You can also add a little bit of sugar to help make the flavoring be more intense, but be careful, nobody wants to drink a sweet Akvavit. So what flavorings should you use? The question is more what flavors do you like? Almost anything can be used but the traditional flavors are dill and cumin but in the store bought versions you often find flavors like fennel, lemon, coriander seeds, gale, anise, orange, and wormwood. But you can go as crazy as you want why not lingonberries, lemongrass, bay leaves, lime, chives, thyme or whatever you feel like trying. I have just made my own Akvavit for this Christmas and below you can see how I made mine. But don’t worry if it won’t be ready for Christmas or the flavoring gets a bit weird, nobody will be complaining when you’re serving shots of Akvavit a Christmas lunch. Combine all ingredients and leave in the fridge for about one week. Check the flavoring after a few days and adjust if necessary. Once done, remove all the spices and pour into a clean bottle. Serve at room temperature.